In neighbouring Glastonbury and Wells are two signs (one not strictly a ghost sign) which remind us of the days when letters were sent by post rather than email. 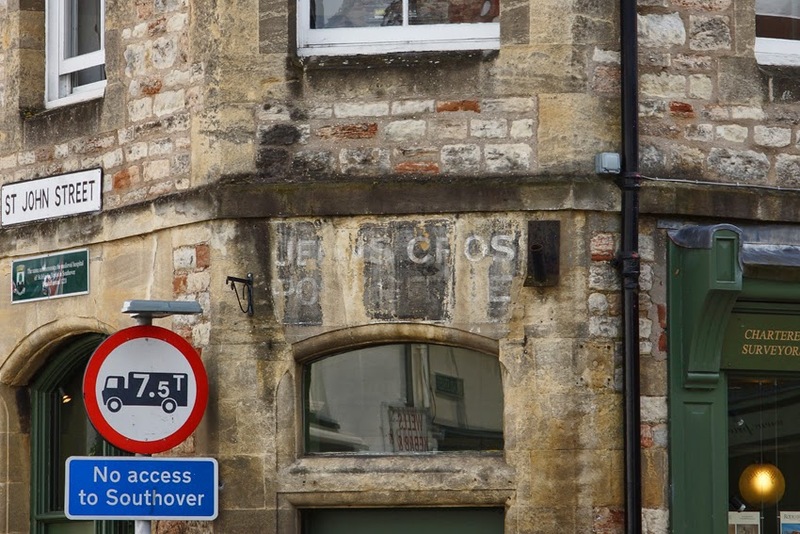 The first is a very faded sign above a door on the corner of St John Street and Queens Road, Wells. I've increased the contrast a little and with care, one can decipher 'Queens Cross Post Office'. XopherD on Flickr offers the information that it was renamed Broad Street Post Office in 1897, so this sign is truly venerable. 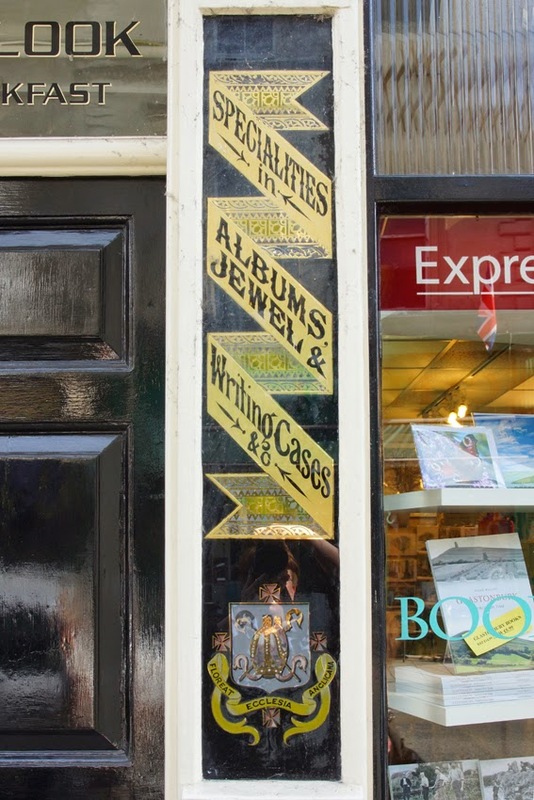 Far more colourful, and equally evocative, is this panel advertising that the premises on Glastonbury High Street are home to 'Specialities in albums, jewel & writing cases, &c'. In fact, to one side is a bed and breakfast; to the other, a bookshop. You will have to go elsewhere for that writing case! The arms at the bottom belong to the town corporation; its motto, 'floreat Ecclesia Anglicana' ('may the Anglican church flourish') fits rather oddly with contemporary Glastonbury. In fact, the arms were not formally granted, although they've been in use since the eighteenth century. I've walked around locks, taken boat trips through them, but recently the Canal & River Trust gave the opportunity to walk along the bottom of one. Happily, it was empty of water at the time! 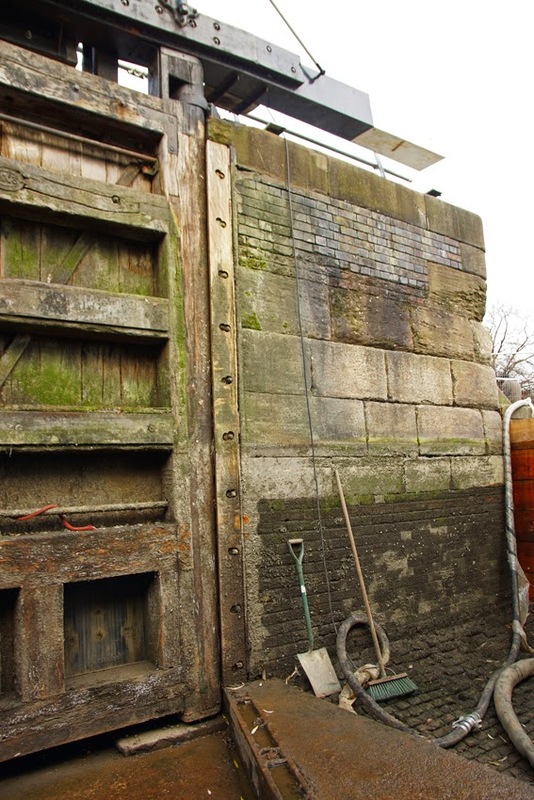 The lock had been drained for repairs: about every 25 years, the large oak gates need to be replaced. Here, the top gates were to be taken out and renewed, while the bottom set were having some repairs. 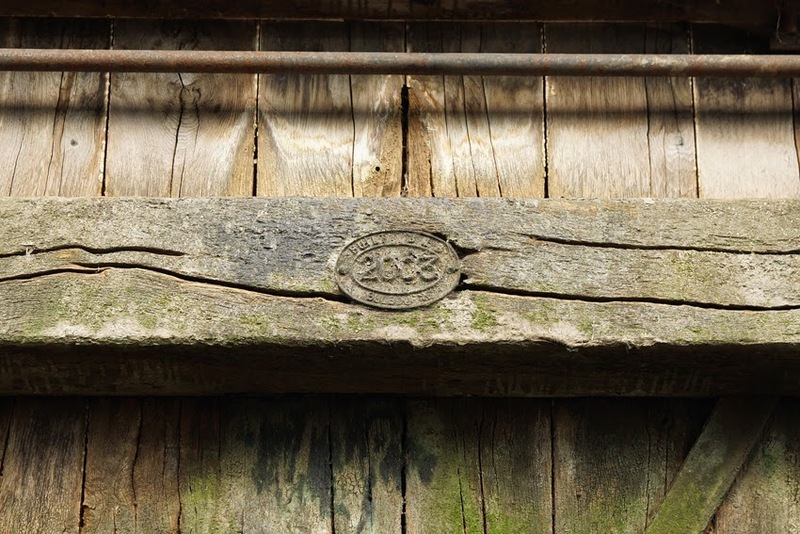 Planks of wood slotted into the lock walls held back the water temporarily. 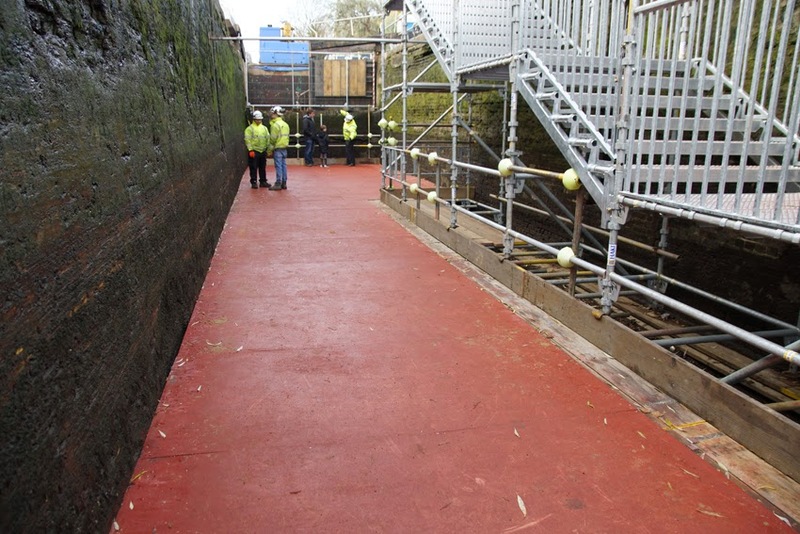 While the lock was dry, visitors got the opportunity to see some usually-submerged Victorian brickwork. 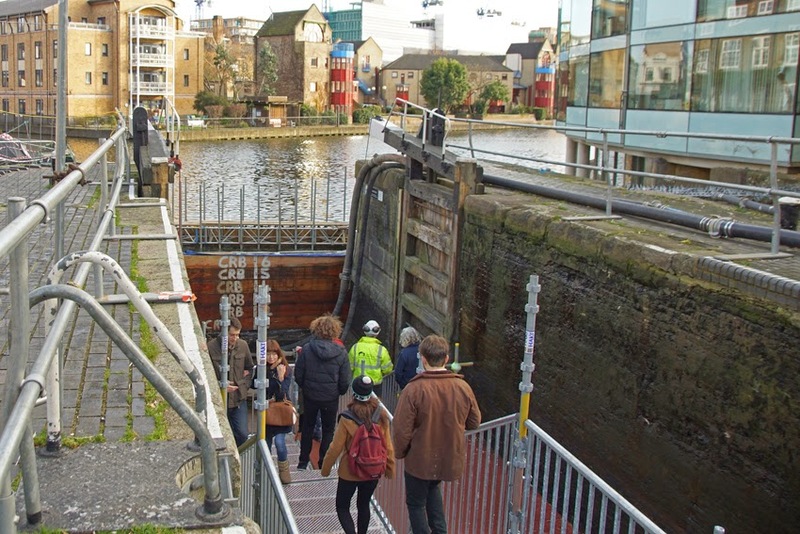 Near Angel, City Road Lock is part of the Regent's Canal which runs between Paddington and Limehouse, via Camden Town and Islington. Designed to link Paddington Basin (terminus of the Grand Junction Canal to the Midlands) with the Thames, it was also tied in to the development of Regent's Park by one of its directors, John Nash. The architect's assistant James Morgan was the canal's engineer. The first stretch, to Camden Town, was completed in 1812 but among the problems delaying this second section from Camden to Limehouse was the embezzlement of funds by promoter and superintendant Thomas Homer. Caught in 1815, he was sentenced to seven years' transportation. 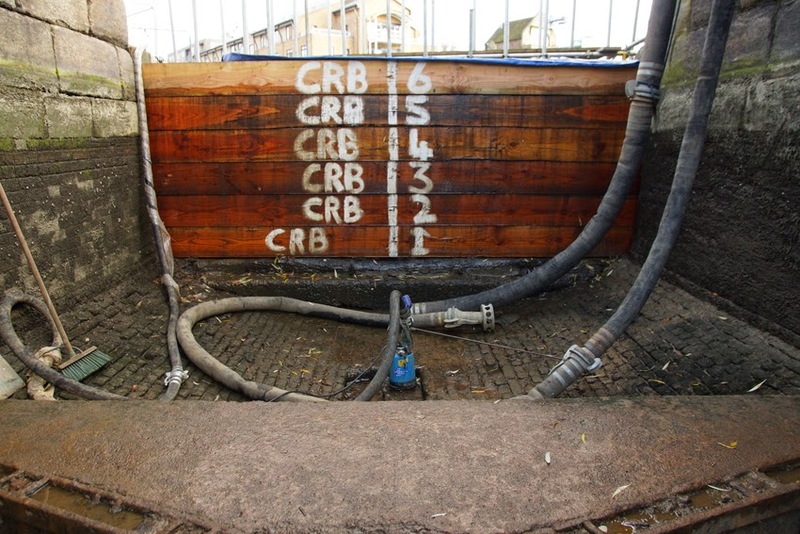 Despite the setbacks, the canal opened in 1820, and nearby City Road Basin became a popular unloading point because it proved more convenient than Paddington Basin. It thrived in the nineteenth century, with cargoes of coal and building materials being unloaded here - although there were several proposals to turn it into a railway - but declined in the last century. Commercial use of the canal ended in the 1960s. Today, the boats which use it mostly do so for pleasure. Want to see more of the lock? Londonist also visited, and made a video; or you could become a volunteer! 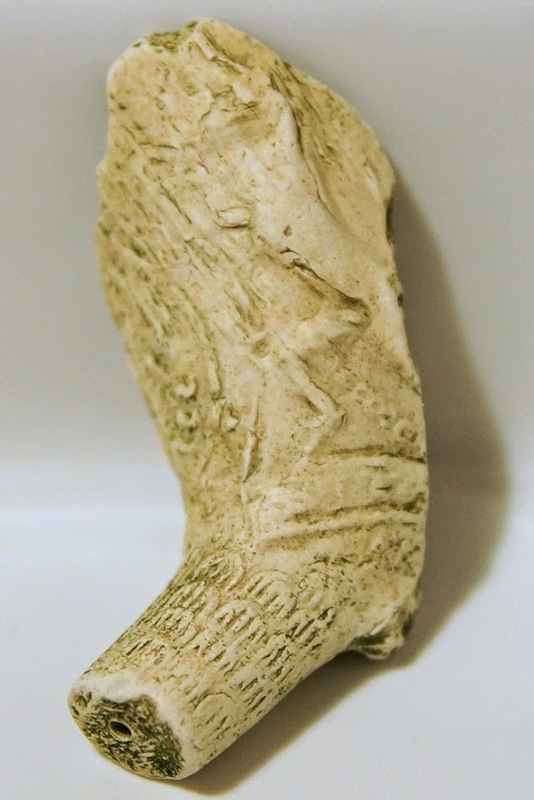 From the seventeenth to nineteenth centuries, clay pipes were used somewhat as cigarettes are today: they offered a relatively inexpensive way of smoking, and the pipes were more or less disposable. However, some were more elaborate than others, with decorated bowls. On a recent walk along the Thames foreshore at Battersea with Jane of Jane's London - who makes lovely jewellery using pieces of antique clay pipe - I found a fragment of one such bowl. 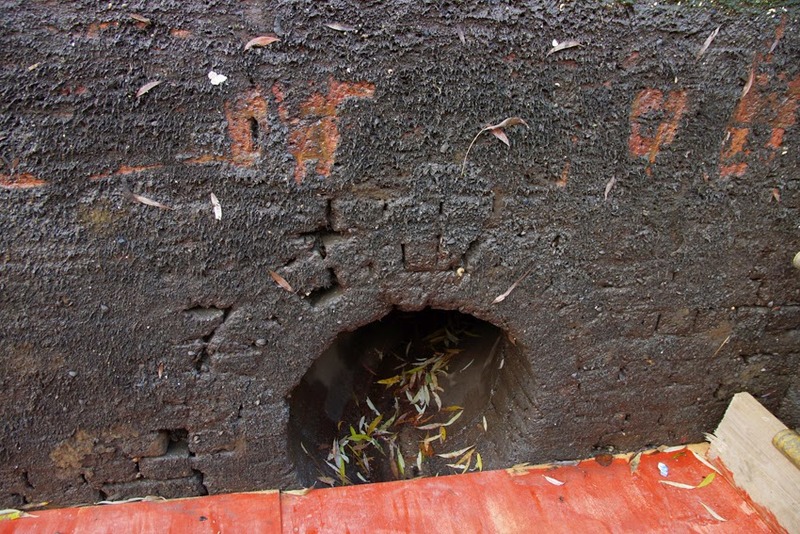 Only part of the design remains, and it has suffered from its time in the river. However, to one side of a central image (largely missing and impossible to decipher) is a naked man stood with chain around one leg. One possibility is that this design commemorated the end of slavery. Earlier pipes had featured the image of a man kneeling in chains, originally distributed on Wedgewood cameos with the anti-slavery slogan 'Am I not a man and a brother?'. The use of anti-slavery imagery on tobacco pipes was of course horribly ironic, since tobacco was largely produced on Virginian plantations using slave labour.